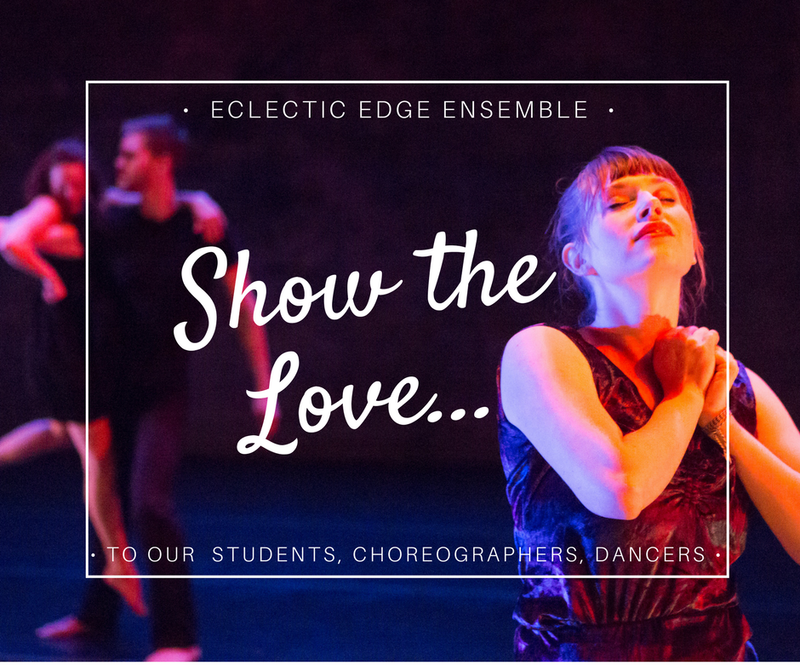 Show the love to Eclectic Edge Ensemble THIS WEEK; February 12th-18th, 2018! This is a pivotal time for Eclectic Edge Ensemble, and your support will help propel us forward with leaps and bounds. 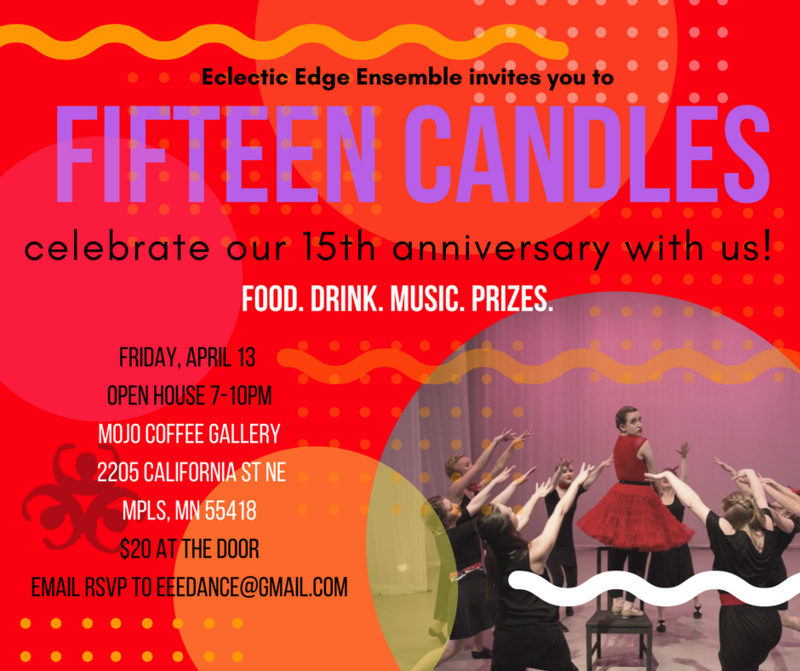 We are ready to keep building momentum as we present our 15th Anniversary Concert celebrating EEE's 15 years and the history of jazz dance in MN (July 2018 @ The Lab Theater - more info below). Each contribution helps in a variety of ways including: providing rehearsal space; costuming; financial assistance for participants in our workshops or summer intensives; helps build our honorarium for our artists; and many production aspects of our shows! Thank you! Breathing life into jazz dance: EEE being one of few jazz dance companies in the Twin Cities moves the jazz tradition forward within our local community while forging our own signature style. Musical collaboration: An important part of EEE's vision is to encourage the practice of collaboration, particularly between musicians and dancers. We feel that creating dance alongside original music allows the two art forms to merge together in the most organic way possible. A company that lives up to its name: We are eclectic in the make-up of our company members, in who we collaborate with, and in the original works we create. By promoting variety, we keep our performances fresh and keep challenging ourselves artistically. Thank you for your support during this pivotal time for EEE and please join us for our 15th Anniversary Concert, July 19-22, 2018. Help EEE reach our goal of $1,200! As we get closer and closer to our goal we will reveal our special EEE Thank you to all of you, our supporters and donors! Give to the Max to EEE! This year, Give to the Max Day falls on November 16th. You may also schedule your donation ahead of time, beginning on November 1st (see below for details.) Donating to EEE is simple and there is no registration necessary. 2) “Give to the Max” day is an all day event! Donate anytime, midnight to 11:59pm! Or you can schedule your donation to EEE ahead of time. Then you don't have to worry forgetting on November 16th. SET IT AN FORGET IT! 3) Tax receipts from GiveMN.org are sent to you automatically! 4) Schedule Your Giving! Between November 1st - 16th, 2017, you’ll be able to schedule your donations on GiveMN.org. Go to GiveMN.org, search for 'Eclectic Edge Ensemble', and select the scheduled giving option. It’s a great way to participate if you’re out of town or like to plan ahead. 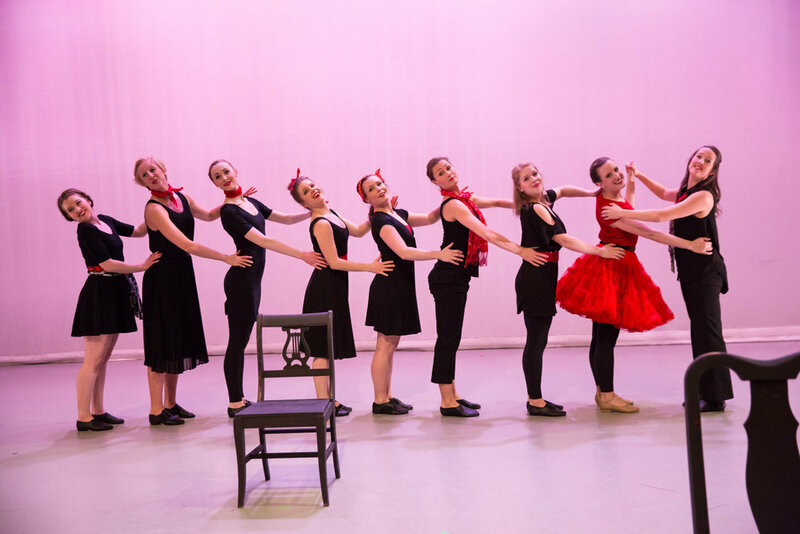 Founded in 2002 by Artistic Director Karis Sloss, Eclectic Edge Ensemble (EEE) is a contemporary jazz dance company with a diverse repertoire that collaborates with local musicians, choreographers, and other artists to create musically and theatrically inspired work. We present a fresh perspective on jazz dance in the Twin Cities by creating accessible performance experiences that connect to audiences through the joy of movement. 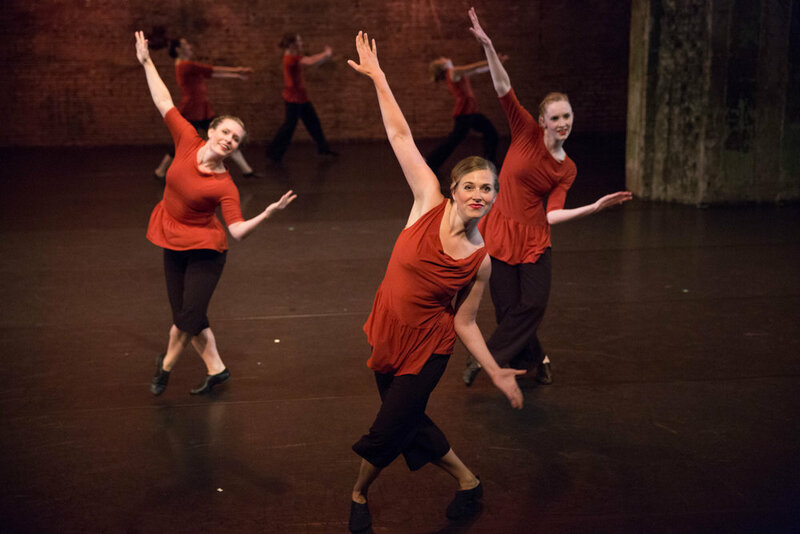 Breathing life into jazz dance: One of the only jazz dance companies in the Twin Cities, Eclectic Edge Ensemble moves the jazz tradition forward within our local dance community while forging our own signature style. A company that lives up to its name: we are eclectic in the make-up of our company members, in who we collaborate with, and in the kinds of pieces we create. By promoting variety we keep our performances fresh and keep challenging ourselves artistically. Over the past five years, EEE's outreach efforts have resulted in 19 residencies throughout the metro area, enabling us to provide a wide variety of movement-based education to students of all ages and abilities. EEE has produced 26 concerts around the metro area. EEE was a Sage Award winner for our production of Lost Voices in Jazz, in July of 2015! EEE has worked with more than 60 amazing dancers! EEE's artistic collaborations include: 15 local composers, 9 guest choreographers, Mad Munchkin Productions, musicians, and many other artistic designers. This is a monumental year for EEE as we celebrate our 15th anniversary of presenting our theatrical jazz works to our community. In July we are presenting a collage of EEE company favorites and works by incredible jazz guest artists including Zoe Sealy, Karla Grotting, Cynthia Gutierrez-Garner and Danny Buraczeski. Our 15th season is highlighting not only EEE's 15 years but celebrating the history of jazz dance in MN and we're excited to share these nostalgic, complex and thought-provoking works with you! We are looking to expand our Outreach efforts this year, with the goal to be actively engaged with multiple dance studios, schools, community centers and/or organizations and within our local dance community through our 2017 season via classes, workshops, intensives and lectures/demonstrations. Your donation can help us continue to extend our reach, providing valuable and necessary funding to bring movement-based education to at-risk and under-served populations. This is a pivotal time for Eclectic Edge Ensemble, and your support will help propel us forward with leaps and bounds. We are ready to keep building on this momentum in 2017 as we jump into our 15th Anniversary Concert celebrating EEE's 15 years and the history of jazz dance in MN (July 2018 @ The Lab Theater). Each contribution helps in a variety of ways including: providing rehearsal space; costuming; financial assistance for participants in our workshops or summer intensives; helps build our honorarium for our artists; and many production aspects of our shows! Oh, there's more! For each class you attend, your name is entered to win a massage with Frank Harris from Hopkins Health and Wellness! Purchase a 4-class pass and your chances rise with your name in the hat an extra time! Furthermore, if you're a dad, you can take class for half price on Father's Day! Thank you for your support and we hope to see you on your mat soon! Day 2 of EEE's Flip Your Refund drive. Thank you for donations that have already come in! For the next 3 DAYS we will focus on raising funds for our 4 guest composers for this summer's production of "First Nights of a Foot Flight." Please help EEE raise $800 to support these incredible artists! Eclectic Edge Ensemble is seeking donations for our upcoming season! Did you have many tax deductions for 2015? Are you looking to expand on tax deductible organizations? Why not get a head start on your charitable donation season and Flip your Refund by making a contribution to Eclectic Edge Ensemble! Help us achieve our goal of $3000 by donating today! EEE is thrilled to be a 501(c)(3), which means every private donation is tax deductible! With this classification we are working to jump to the next level by staging multiple productions, continuing to build our outreach program and collaborating with multiple artists. It is very exciting but can be scary at the same time. I know we are ready, and your support is a huge help to us! Each contribution helps in a variety of ways including providing rehearsal space, costuming of the company, provides financial assistance for participants in our summer intensives, helps build our honorarium for our artists as well as many production aspects of our shows! Visit our donation page to make your contribution today! EEE's Outreach efforts have resulted in 18 residencies throughout the metro area over the past 4 years, enabling us to provide a wide variety of movement-based education to students of all ages and abilities. EEE is a Sage Award Honoree for our production of Lost Voices in Jazz, in July of 2015! We've worked with more than 60 amazing dancers! Obtained status as an independent 501(c)(3) organization! Your contribution is tax deductible to the extent allowed by law. We recently closed Snow Bound! celebrating the 5th Anniversary since its creation, and we are beyond proud of our final product. Bringing together 21 performers from EEE and Mad Munchkin Production, 5 local composer, five technical designers, we were able to bring a very magical show to The Lab Theater. We also reached out to the community with our Youth Winter Poetry competition where we had over 80 submissions and had 15 students read their poems live at one of our performances of Snow Bound. EEE is honored to be a Guest Resident for The Southern Theater's 2016 ArtShare Program! July 21st-24th, 2016 EEE presents First Nights of a Foot Flight at the Southern Theater. First Nights will be an evening of jazz dance sure to make you want to move! Accompanied by newly composed music, the evening will include concert works by Sloss, guest choreographer Kaleena Miller, and a preview of Sloss' future evening length work - an adaptation of A Midsummer Night’s Dream. Not to be missed, this preview is a story filled with magic, mystery, betrayal, and...a monkey! EEE is honored to be a Guest Resident for The Southern Theater's ArtShare Program! We closed our 2014-15 season with “Lost Voices in Jazz -The Choreographers of the Minnesota Jazz Dance Company." We were grateful to be a part of such a historic performance, and were honored with a Sage Award for Outstanding Dance Performance! This is the first nomination and award for EEE and we are grateful to be recognized by our dance community. We hope to continue to build off of this momentum and are looking for you support. We are looking to expand our Outreach efforts this year, with the goal to be actively engaged with multiple dance studios, schools, community centers and/or organizations and within our local dance community through our 2016 season via classes, workshops, intensives and lectures/demonstrations. Your donation can help us continue to extend our reach, providing valuable and necessary funding to bring movement-based education to at-risk and under-served populations.